This Carnival reveler and I took the early train from Antibes to Nice, had dinner at Taverna Massena (our favorite pizza place in Nice) on Place Massena, and paid our 10€-admission fee in plenty of time to watch the festivities commence at 9:00pm on the Promenade des Anglais. The Carnaval de Nice lasts from February 11th through Mardi Gras on February 28th. 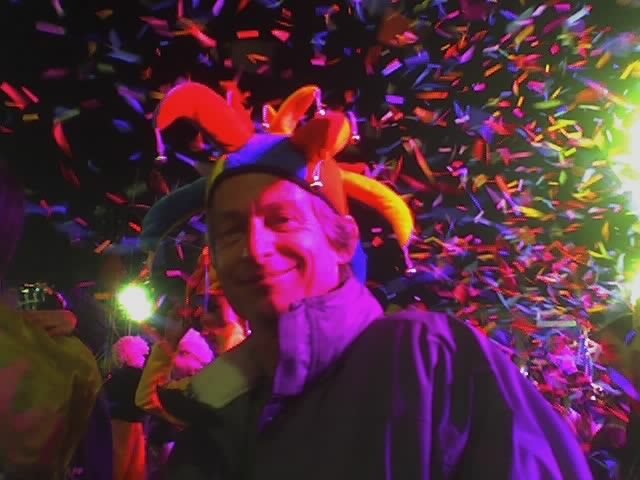 The 122nd Edition of the Nice Carnival has as its theme, << Roi des Dupes >> (King of Fools), which illustrates the difficulty of distinguishing between Fact and Fiction. The premise is that the fine line between Myth and Reality is so blurred that it cannot actually be seen in society today. 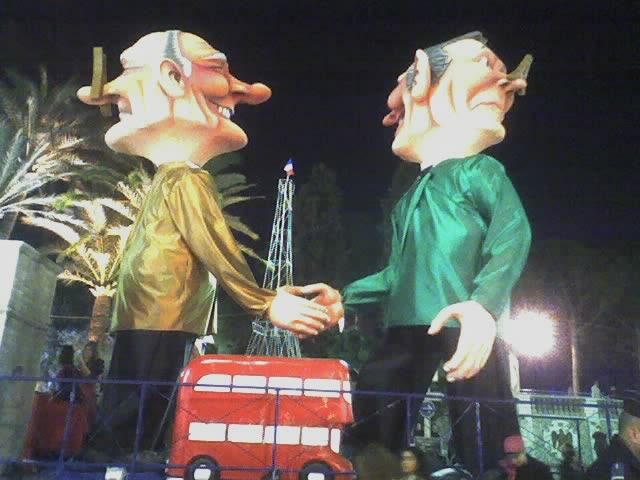 The two faces each of France’s President and of Great Britain’s Prime Minister, on the char de défilé (parade float) in the photo above, is an example of this duality. Jacques Chirac and Tony Blair appear to be happy to see each other face-to-face, when in reality, their other faces show that they both have to hold their noses because they are each repulsed by the other. 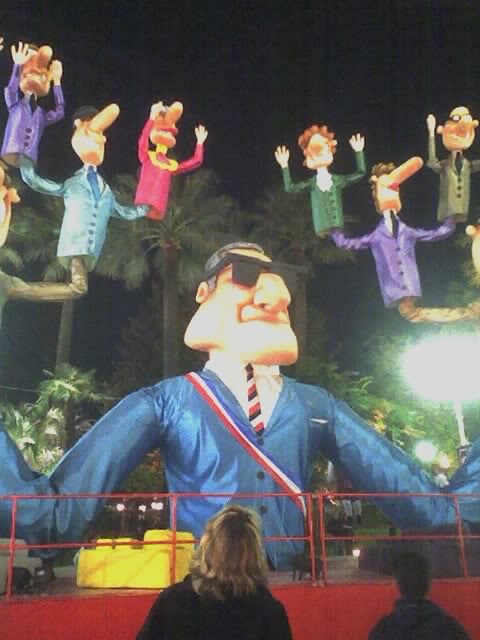 This char de défilé is entitled << L’Employeur >> (The Employer), and it satirizes the manipulation of the city workers of Nice by le maire (the mayor), Jacques Peyrat. 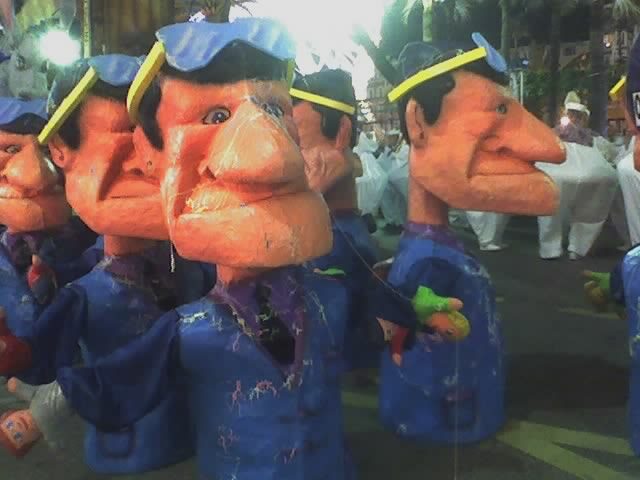 In addition to the 20 or so floats, the Nice Carnival has traditionally consisted of around 180 << grosses têtes >> (big heads), 30 of which are made from papier-maché, using the ancestral technique of layering the paper onto a mold, one sheet at a time, each one over the other one.